Bay Club members were fortunate to have the opportunity to travel to Wannamoisett Country Club in Rumford, RI on June 25 to watch their own Peter Uihlein win the 50th Northeast Amateur Invitational. 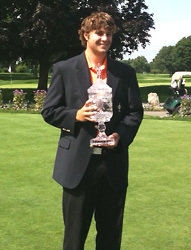 Â Peter set a tournament record with a four-round total of 261, 15-under par to win by three shots. Â To view the complete final scores, please click here. Uihlein, the defending U.S. Amateur champ and the reigning Ben Hogan Player of the Year Award winner, will be entering his senior year at Oklahoma State University in the Fall.Â His next stop is the AT&T National tournament Monday, June 27 – Sunday July 3 at Aronimink Golf Club in Newtown Square, PA.